A Florentine painter and draughtsman, Bachiacca is chiefly recognized as an artist who helped evolve the style of Mannerism. 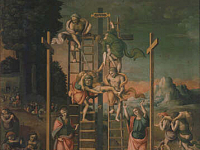 He is said to have studied with Umbrian painter, Pietro Perugino (1446 – 1524) and also collaborated with other artists of the time such as Franciabigio (1482 – 1525) and Pontormo (1494 – 1557). His style gathered many influences, showing an artistic knowledge beyond that of Florence. The Grove Dictionary of Art notes this in his piece, Adam and Eve with their Children. In the work, Bachiacca painted Adam and Eve in the style of Perugino’s piece, Apollo and Marsyas, and the children in the style of Marcantonio Raimondi’s (1480 – 1534) engraving, God Appearing to Noah. Though, still more diverse is his borrowing of German artist Albrecht Dürer’s piece of Adam and Eve, for the landscape background. The spelling of his name is sometimes seen as Bacchiacca, and is sometimes known as Francesco d’Ubertino Verdi.